In “One Person, No Vote: How Voter Suppression Is Destroying Our Democracy,” Emory historian Carol Anderson asserts that many of the efforts employed to impede black voters in the Jim Crow South are still being used successfully today. 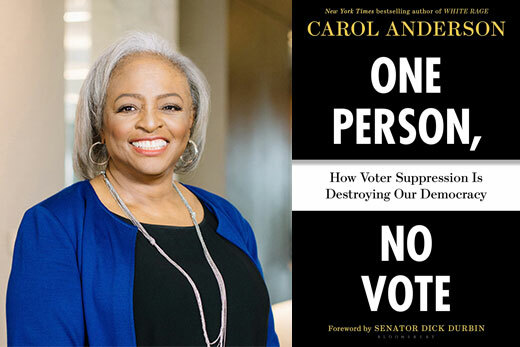 Emory historian Carol Anderson’s best-selling account of attacks on voting rights in America, “One Person, No Vote: How Voter Suppression Is Destroying Our Democracy,” has been named one of five finalists for the 2019 PEN America Literary Award in nonfiction. The PEN / John Kenneth Galbraith Award for Nonfiction honors distinguished works of general nonfiction published in 2017 and 2018 and includes a $10,000 prize. The nonprofit organization PEN America will announce winners Feb. 26 in New York. A full list of nominees is posted on the group’s website. “One Person, No Vote” outlines the history of voter suppression including in the current era. Anderson, who serves as Charles Howard Candler Professor and chair of African American Studies at Emory, includes research that shows how gerrymandering, poll closure and other tactics effectively dampened the participation of African American voters. The book has been recognized as one of the best books of 2018 by the Washington Post, Boston Globe, NPR and others. It was also chosen for the top 10 longlist for the 2018 National Book Award for Nonfiction. An acclaimed public scholar whose research has long focused on the creation and unraveling of public policy and how racism affects the process, Anderson was awarded a 2018 Guggenheim Fellowship for her work. “One Person, No Vote” is also something of a sequel to 2016’s “White Rage: The Unspoken Truth of Our Racial Divide,” Anderson’s groundbreaking examination of efforts by white America to marginalize and oppress African Americans after the Civil War. That book was a New York Times best-seller and won the 2016 National Book Critics Award in criticism. It was also named one of the year’s best books by the New York Times, Washington Post, St. Louis Post-Dispatch and other publications.